Many times a huge amount can be gathered, if you hit it right during its growth cycle. Here is a lot ( no pun intended ) of edge trimming to do! AND if found growing on deciduous trees ( hardwoods ) - especially oak. Oak is great. 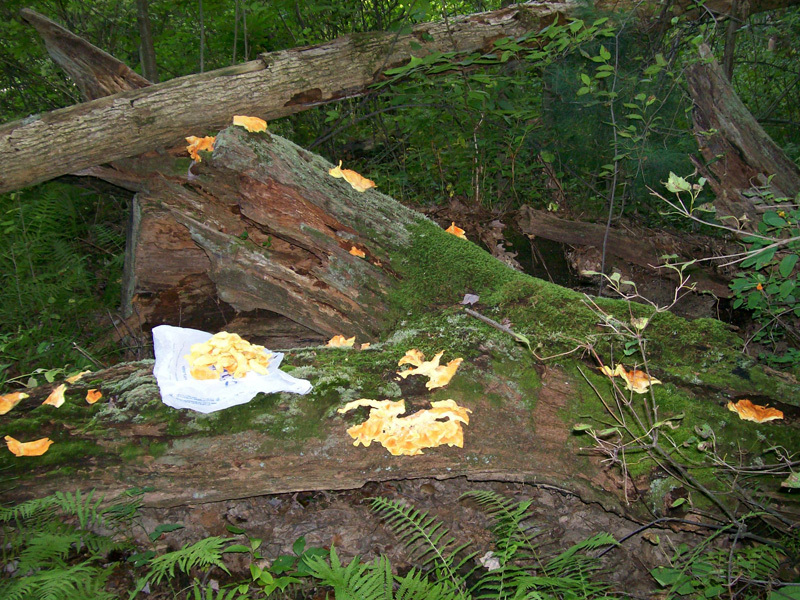 It's not a good idea to eat these gems if found growing on Hemlock or other conifer trees. Most adverse reactions in consuming these are attributed to growth on those type of host trees. Note there are no gills. They have a multitude of very tiny pores ( poly ), hence their Family name - Polyporaceae. And also see the sulphur yellow color on the underside. 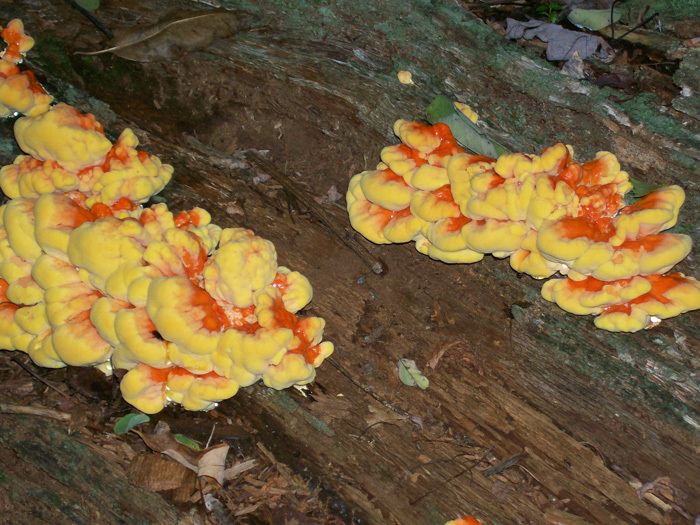 Quite a site to notice these 'Hunter Orange ' colored mushrooms among the dark background. They stick out like a sore thumb. Best practice is to harvest the outer edge, about 1 inch to 1 1/2 inches inward. Cut off a shelf from the group, inspect to make sure it's clean and bug free, then use your knife to slice off some of the edge. Here is a pristine lot of edge pieces, about 2 pounds believe it or not. These will cook up perfectly - or freeze just as they are. 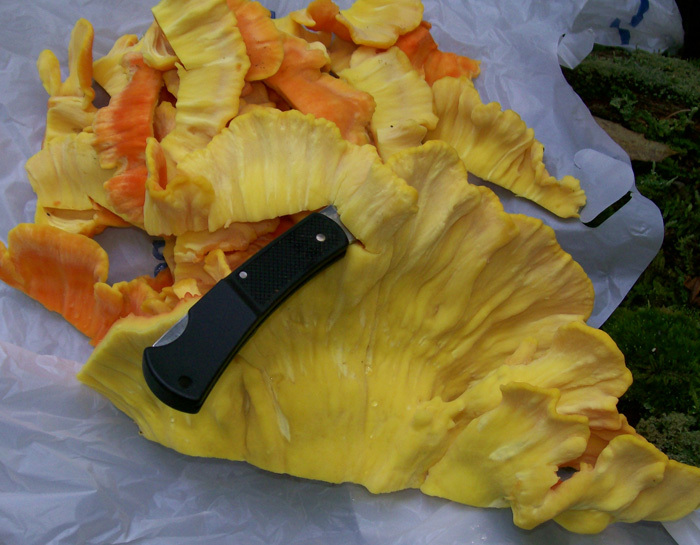 Sometimes while seeking wild mushrooms you REALLY get lucky. Did you know that you can find the 'equivalent' of button mushrooms in a group of sulphur shelfs? 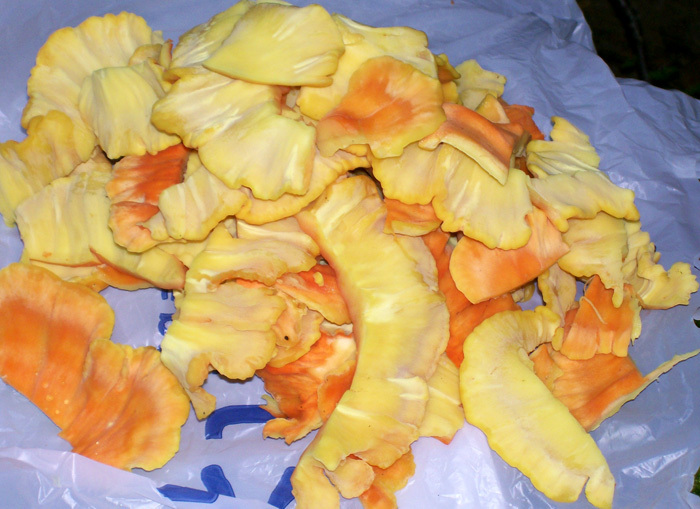 Mushrooms so fresh that the growth is just starting and has not yet displayed it's various shelves. 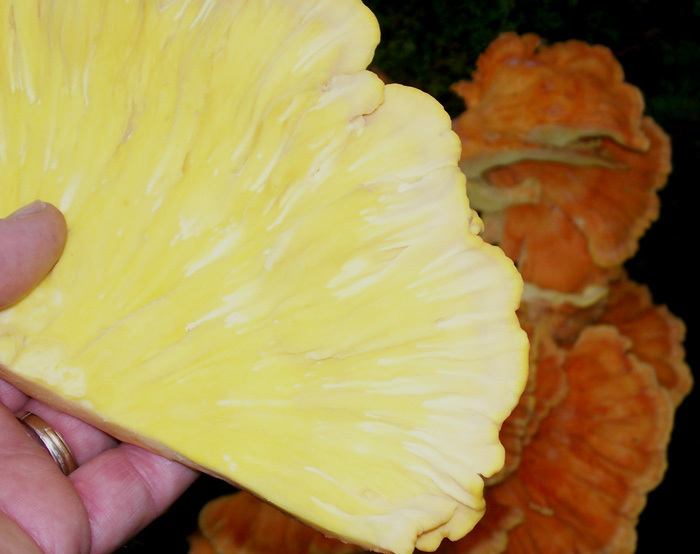 When you gently squeeze any part it is all uniformly soft, moist and perfect - just like a fresh regular button mushroom. With these you can harvest / cut off the whole group right next to the branch / trunk. Click the photo and see what these look like three days later. Here is another good 'Best Practice'. After you have harvested the edges that you want you will have a bunch of cannabalized partial shelfs. Don't waste them. Look around. Do you see any other dead or dying hardwood trees, deadfalls or branches? Those are candidates for seeding. Take those partial shelfs and rub their underbellies into holes and/or depressions in those new hosts. Just like they do with Oyster mushrooms on Aspen logs. 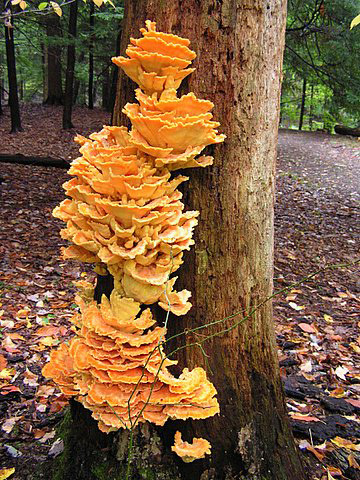 Help these delectable fungi fructify. In a couple of years there will be a potential bigger harvest. In the photo below I took all the shelfs, and shelf pieces and stuck them into any hole, depression, crevice, etc. i could find in that surrounding area and a few other dead trees close by. DATE - September 9 and September 12, 2009 and several other days thereafter but I already have enough frozen. 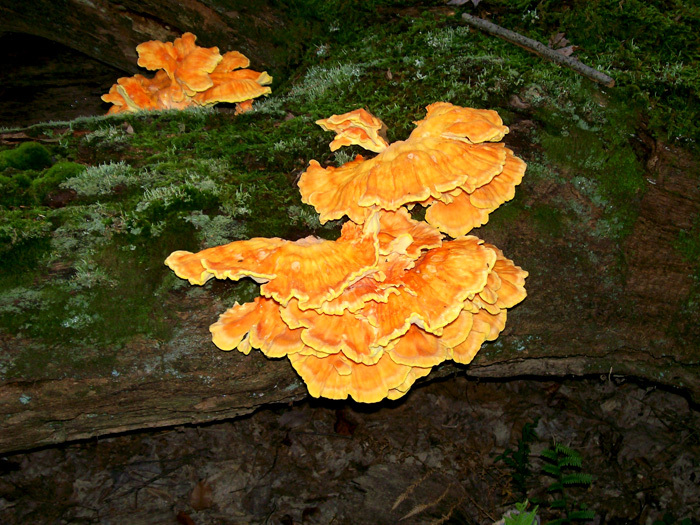 FOUND - Laurel Hill State Park, Pennsylvania ( near Bakersville ), near the Visitor Center woods and also near group cabins area. 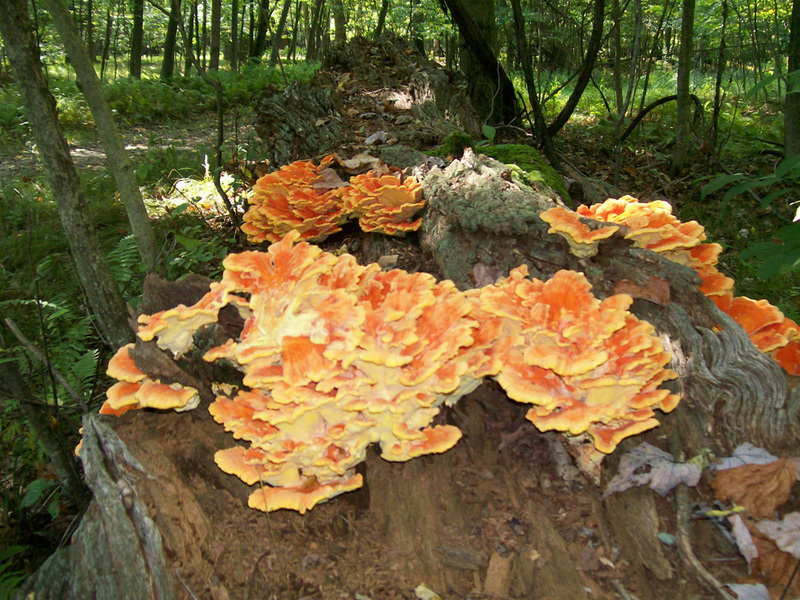 Two groups of approximately 8 shelves each were found growing on a fallen oak branch. Another crop of approximately 20 groups - the 'Young Ones' were 'Very' fresh, very moist especially in light of the prior three days having been on the dry side. Weather conditions: approximately three dry days after having been damp for a week. Woods not overly wet.